A collection of pre-configured reports are included with LegalStratus home pages and dashboards. The embedded report wizard enables even novice users to change existing reports or create new ones. Reports can be shared, run on a scheduled basis and automatically sent out via email. Dashboards are a collection of reports which can be set for individuals and groups while providing users to configure them in nearly an infinite number of options. 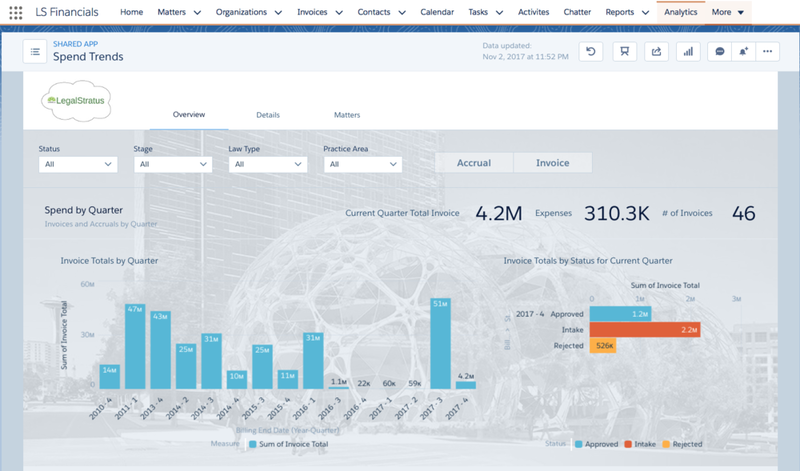 Intuitve drag and drop interfaces enables users to add, resize and remove as many reports as they want to see on a screen -- all of which is also available on the LegalStratus mobile app. The optional Wave Analytics feature allows for even greater depth of analysis by providing predictive analytics and world class graphical reporting tools.